We are using a non-CM friendly textbook for grammar during our third grade year. We are using Rod & Staff which is a textbook and originally written to be used in a classroom. Here is some information on Rod and Staff. Rod and Staff do not have their own publisher. You can look here. English 3 has 125 lessons in 5 units with review built-in. You can purchase a set which includes a student book, teacher manual, test booklet, and worksheet booklet for around $38. I actually found a teacher book and student book used for around $15 which worked for us since we are not using worksheets and traditional tests. You can look around places like Ebay and Vegsource, local curriculum sales, and other online used sources. We are on a tight budget this year so used is what I went for. I don’t mind buying new but I do like to check around if possible. Now let’s walk through how we use Rod and Staff. The first two lessons are on using a dictionary and alphabetical order. D is still at that stage where he sings the alphabet song silently to figure out some of the letter orders but that is okay. He is 8 and the more we work on alphabetizing that easier it will be for him. Right now I am using this as a “get familiar” exercise which will come in handy later as he takes on more ownership of his work. To which we promptly sing it with as much gusto as possible. This of course wakes up dad to whom we apologize. Getting D’s focus back to the task at hand is seemingly impossible as all he wants to do is march around shouting out the alphabet. Sigh. Five minutes have now passed and finally he is back at the table after telling him his token was being turned to the red side. That spells trouble for him. Now that we’ve refreshed ourselves on the order of the letters, tell me about our names. Now I’ve done it again. He is in a fit of laughter as he tells me our names. Not what I was looking for at all. You are right. Those are our names. Now tell me what we can do with our names using the alphabet. Ahh, now I see that twinkle in his eye and the wrinkling of his forehead that tells me I’ve got him. Now he is tapping his chin as he thinks when suddenly he jumps from his chair and (here I have to remind him not to yell but he can whisper yell his answer) tells me put them in order. He tells me my name first and then his. He is correct but I have him tell me why they go in that order. With an eye roll he tells “because a comes first then d, don’t you know that already momma?”. Let’s get out our book and see what it tells us. By now he has spied the dictionary laying on the table and only wants to flip through it. I must do something about his wandering attention. We begin by reading the first two paragraphs along with the first column of words. Now take out your writing board, marker, and eraser. Starting with the first column of words, put them in the correct order using the bold letter. Now look at the second column of words. What do you see? That is right. They all begin with the same letter. What do you think we need to do? That is correct, we use the next letter. Now put those in order. Look at the third column of words. Tell me about them. At this point he is already beginning to put them in alphabetical order. It should be noted here that I do not interrupt until he has completed putting the column(s) into order. Once done, we go over them. If something is not in its correct place, I gently lead him to figure it out himself. Sometimes this might require him to sing the alphabet and that is okay. The point is for him to make the connection and then correct his work. Here D is working on writing the words in alphabetical order on his board. Now let’s look at the practice page. Work on columns 1 and 4. When you are done we will check the work together. I do not have him work on paper at this point. The board makes it easier to correct the mistakes plus the board is not used often enough to seem “common” for him. It still holds a “special” spot when allowed use. Rod and Staff has a lot of practice built into to it. I do not have him do more than is necessary to ensure he has grasped the concept. This allows me to pull out more practice as needed or to use non-familiar examples as review. That is it for the first lesson. We do 2 lessons a week. Today we are going to use a dictionary. What have you learned that might help you when using a dictionary? I was sure when I asked this that I would get the answer promptly and with confidence. Instead, I get two minutes of “the look”. He just stares at me with his eyes all huge and well it reminds me of the look my cat gives me when he wants treats. I realize this may be a long lesson time. I admit, I am crest-fallen at this prospect so I immediately begin to revise our objectives. Let’s think over what we learned during the last lesson from our book. Now he gets it and responds with put things in order though he does say it more like a question than the desired confidence of correct recall. Yes, we will use our skill in alphabetizing to use the dictionary. Turn to page 22 an let’s read about the dictionary. We read the short paragraphs on page 22. The example word is bouquet so we look that up. Note:This lesson is mostly useful in the practice section. 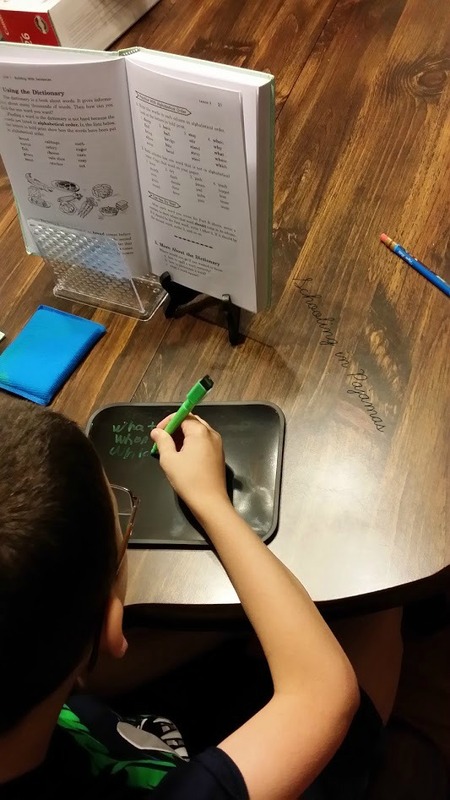 This is where it wants you to practice finding the correct spelling of a word, the pronunciation, and answer some questions. Let’s use the word bouquet. Find it in the dictionary. Here we pause to look over the dictionary before using it. We locate each part of it, how the pages are laid out, the letters on the ends of the pages, and anything that strikes his fancy. This gets the awe and quest for exploration out of the way before diving into the task at hand. We find bouquet together with me pointing out the b at the edge of the pages. I guide him with gentle questions asking him to act like I don’t know how to do alphabetizing. To this he responds we would go to the page at the beginning of the “g” section. So we turn to that section. Now I can see he is getting a bit agitated so I again give him a nudge by explaining the words at the tops of the pages. This seems to help so he guides me to the first page with “go”. Now that he understands how the guide words work, he makes quick work of finding the page with bouquet on it. We browse through the entry and all its information. Now before we end our lesson, let us look up five words. I give him these words – ant, house, friend, tree, brother. He is given time to find them on his own with intervention only upon his request. I must remember that I am not doing the work for him but must guide him. He needs to make connections without relying on my hints, clues, or other direct aids. We done for the week. He spends the next five minutes browsing the dictionary and regaling me with all the information he finds. 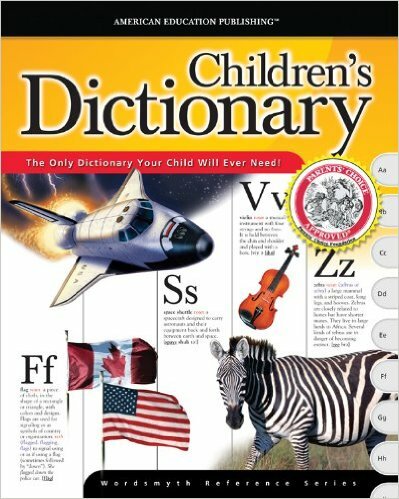 Here is the dictionary we use in the lower grades. Of course we have several “higher” dictionaries available too.